The Dell XPS Tower Special Edition adds 8th-gen Intel processors and better customization options to one of the best-looking and most upgradable gaming PCs around. With a gorgeous, unassuming design and incredibly easy upgradability, Dell’s XPS Tower Special Edition seemed hard to improve on. But Dell found a way, giving its sleek PC a handy USB-C port, better configuration options, and, most notably, Intel’s speedy new 8th-generation processors. The Dell XPS Tower has long been the PC to get if you favor stylish simplicity over sharp angles and flashing lights, and it’s only gotten better with age. There’s no reason to mess with a great thing, which is why Dell’s latest XPS Tower Special Edition looks nearly identical to previous models. You’ve still got the same sleek chassis and striking silver faceplate that make an equally good fit for both offices and gaming dens. The XPS Tower also retains the same brilliant tool-free upgradability that it borrowed from the Alienware Aurora, which lets you pop the machine open and remove the graphics card without lifting a screwdriver. At 15.22 x 14 x 7 inches, the XPS Tower is still one of the most unassumingly compact desktops around, with a design that’s even more desk-friendly than the Alienware Aurora, and shorter than the Corsair One. There is one small but notable change, however: a front-facing USB-C port. This brings the XPS Tower up to speed with other gaming desktops such as the MSI Infinite and Acer Aspire GX, and provides an easy means of hooking up your (probably growing) collection of USB-C gadgets. I would have liked to have seen a Thunderbolt port for extra-fast storage transfers, but USB-C is a nice step forward. As one of the first gaming desktops with Intel’s new 8th-gen processors, the XPS Tower Special Edition delivers a significant performance boost over previous generations. When comparing benchmark results between our new Core i7-8700 unit and our previous Core i7-7700K model (both packing an Nvidia GTX 1070), we noticed almost universal improvements to both gaming and multitasking. Our new XPS Tower ran Rise of the Tomb Raider (1080p with max settings) at a strong 63.62 frames per second (fps), topping the 51.38 fps turned in by our Kaby Lake unit. The latest XPS Tower also tops our Lenovo Y710 (GTX 1070; 55.4 fps), and matches our 62 fps category average. Intel’s new processor also brought significant improvements to overall CPU performance, turning in a 22,124 on the Geekbench 4 overall performance test. That’s a significant step up from the 17,107 scored by our 7th-gen model, and well above the Lenovo Y710 (Core i7; 14,815) as well as our 17,633 gaming PC average. There were, however, a handful of benchmarks that didn’t get a bump from the 8th-gen Core. Both versions of the XPS Tower turned in nearly identical scores on the 3DMark Fire Strike Ultra 4K test (4,142 for 8th-gen; 4,212 for 7th-gen), as well as for the SteamVR Performance Test (10.7 for 8th-gen; 10.8 for 6th-gen). The XPS Tower comes with Dell’s usual office mouse and keyboard, which are serviceable enough for everyday use but not ideal for serious gaming. Other than dedicated volume controls, there’s not a whole lot to the XPS Tower’s included keyboard. I had little problem speeding through a typing test at 95 words per minute with near perfect accuracy, but due to how mushy the keys were, I didn’t do so comfortably. The included mouse is similarly spartan, lacking any extra click buttons or a DPI switch. The XPS Tower isn’t the only mainstream gaming PC that comes with generic accessories (some don’t include any at all), but you’ll want to pick up a dedicated gaming mouse and keyboard if you’re getting this machine primarily for play. My biggest gripe with previous versions of the XPS Tower is that there weren’t a ton of ways to customize your model once you settled on a configuration. Fortunately, Dell’s desktop is now fully configurable. The base $999 model features an Intel Core i5-8400 processor, 8GB of RAM, a 1TB hard drive and an Nvidia GTX 1050 Ti graphics card. From there, you can add on a variety of more powerful parts, including up to a Core i7-8700K CPU, 64GB of RAM and Nvidia GTX 1080 graphics with storage options that include up to a 512GB SSD and 2TB hard drive. Our $1,499 review unit came with an Intel Core i7-8700 processor, 16GB of RAM, a 256GB SSD with a 1TB hard drive and an Nvidia GTX 1070 graphics card. That’s a pretty strong value when compared with the similarly sleek Corsair One, which offers a nearly identical GTX 1070 config for $1,799. 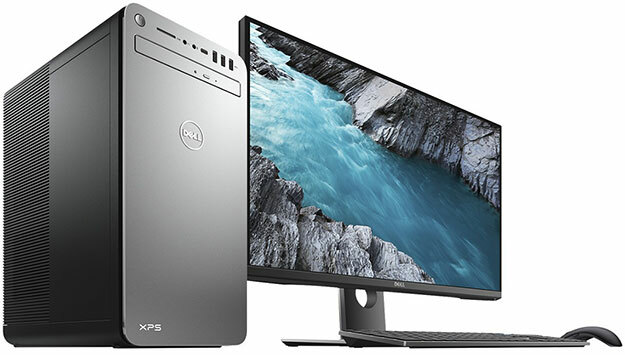 If you want a gaming PC that’s as powerful, upgradable and unassuming enough to sit anywhere, from your office to your command center, the Dell XPS Tower Special Edition is at the top of its class. This latest 8th-gen refresh retains the excellent, painlessly upgradable design of previous models, while adding more convenient ports, better configuration options and a whole lot more power. If you’re on an extra-tight budget, consider Dell’s Ryzen-powered Inspiron Gaming Desktop ($529 starting. If you want something more eye-popping with the same great upgradability, go for the Alienware Aurora ($799 starting). 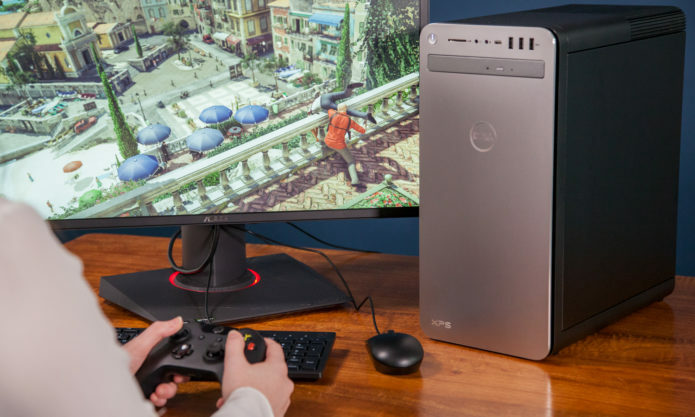 But if you’re willing to pay a bit more, and are seeking a powerful and customizable gaming PC that looks like an everyday computer, you won’t find one better than the Dell XPS Tower.